Trigeminal neuralgia is a syndrome characterised by paroxysms of pain (sharp bouts of pain) affecting one side of the face. The sensory supply to the face is carried by the trigeminal nerve. This nerve has 3 branches: (I) the area of the eye, upper eye lid and forehead, (II) the cheek area, (III) the area of the jaw. The pain may affect one or more branches and is usually a very intense, throbbing pain, which can appear spontaneously or after small stimulations, such as the wind blowing, talking, chewing, applying cosmetics, or brushing the teeth. Usually, there are certain points where the slightest touch triggers pain crises. Often patients stop wearing makeup to avoid the pain it causes. Trigeminal neuralgia is caused by the compression of the trigeminal nerve inside the head by other structures, such as an artery (usually the cause), a vein (more rarely) and, on very rare occasions, by tumours. In some cases, but much less frequently, the cause may be a plaque of demyelination. First, trigeminal neuralgia is treated by administering some drugs derived from anti-epileptic drugs (AED) that control the pain crises, at least initially. Over time, the dose will have to be increased until, in many cases, the pain is no longer controlled well and side effects appear due to the high doses of medication. Surgical treatment becomes a possibility when medication is no longer effective, when the pain can no longer be sufficiently well controlled despite the high doses of medication, or when the high doses of medication cause unpleasant side effects. Carrying out a microvascular decompression to eliminate the underlying cause of pain: nerve compression by an artery, vein, or tumour. Lesioning the trigeminal nerve in percutaneous procedures. Stimulating the trigeminal nerve, its branches, or the trigeminal ganglion using electric currents. In a microvascular decompression, an opening is created in the skull just behind the ear. 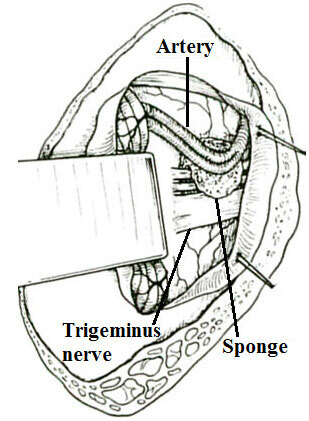 The trigeminal nerve is accessed through this small window at the point where the nerve exits the brain. If the trigeminal nerve is being compressed by a tumour, it is removed. 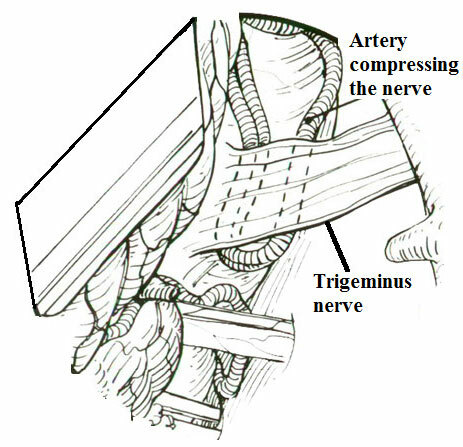 If it is being compressed by an artery or vein, it its displaced so that it no longer compresses the nerve and a plastic pad, which will prevent the vessel compressing the nerve in the future, is inserted. This is a very effective procedure that usually preserves the full functionality of the nerve, but it requires a craniotomy and so it cannot be done in the older patients due to their poor general condition. RF may be used to partially burn the affected branch of the nerve. The more the nerve is lesioned, the longer the pain relief will last, but the sensitivity loss and the loss of strength of the masticatory muscles will also be greater. This option is generally recommended for neuralgia of the IInd and IIIrd branches, but not for neuralgia of the Ist branch. 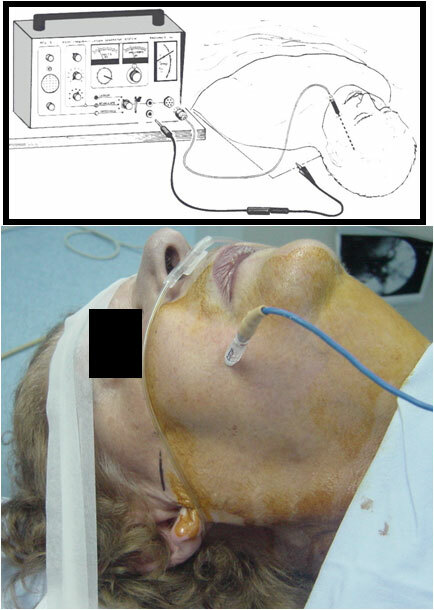 A balloon that compresses the trigeminal ganglion may be inserted. It treats all 3 branches, but during the procedure a significant bradycardia is usually induced, so it cannot be applied to people with cardiovascular diseases. Glicerol may be injected. This lesions the nerve less than the other options, so it is recommended for patients suffering from neuralgia of the Ist branch. It should be noted that all percutaneous procedures are temporary measures, but can be applied in the older patients and in those with poor general condition. Radiosurgery is applied in cases refractory to other medical treatments. Its success rate is lower and the recurrence of pain is common, but it can be helpful for those who do not respond to any other treatment. Neurostimulation, which involves applying an electrode that stimulates one of the branches or the trigeminal ganglion, is also applied in cases which are refractory to other treatments. It is especially useful in post-traumatic or postoperative neuralgia. In cases of cancer pain, morphine may be administered within the brain or the trigeminal nerve nucleus in the brain stem can be destroyed using RF. CAN THE PAIN COME BACK? YES. In percutaneous procedures it is common for the pain to gradually return over time, and in microvascular decompression, though the large majority of patients are completely free of pain, in a small percentage the pain may persist or return over the years.